TIP POWER RATIO for the Flap-turbine. Definition Of the Tip Power Ratio. Recently, a friend of mine asked me what the optimum sail width for a drag type turbine was. I have built a couple of flap turbines and it never occurred to me to calculate the optimum sail width. It seemed like a hard problem to tackle and not being able to find any information on the internet I decided to work on the calculation myself. Since drag type turbines, in particular, the flap turbine, works (more or less) with the same principles as the Pelton turbine I decided to start my investigation with the Pelton turbine. I came across this very helpful wiki page about Pelton turbines here. For the purposes of simplicity I will not be going into the details of my calculation here, instead I will present and describe my findings. If you are interested and like math, please check the sail width and power calculations by selecting the link below. After reading the wiki article for the Pelton turbine and going through the calculations presented, I found the following differences between the Pelton water turbine and the flap turbine. The Pelton turbine has one point of impact with water whereas air impacts the whole surface of the flap turbine sail. However for maximum efficiency for both turbines the center of the sails velocity should be half of the wind or air velocity. The Pelton turbines bucket’s is hit in only one small area and that is what makes these turbines efficient. 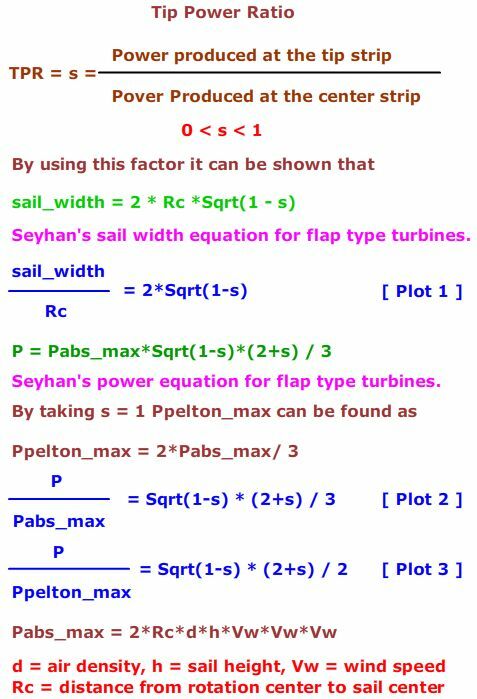 For the flap turbine the center of the sail is working as efficiently as the Pelton sail, however the further away we move from the center the more inefficient the power production becomes. This is due to the fact that the outer part of the sail is moving faster than the center of the sail. This reduction in efficiency is because the sail is actually moving away from the wind faster than the center of the sail. The slow motion of the inner part of the sail also creates inefficiency, since the power related to force times velocity, the slower speed means less velocity. We can consider the flap turbine as a sum of infinite number of Pelton turbines (remember integral calculus) where the air jet coming in a straight line along the sail is parallel to the rotation of the axis. Each of these turbines works with different efficiencies, the most efficient one being the center strip. The efficiencies of the strips decrease the further we go from the center line of the sail (in either direction.) The following figure is of a sail where the center line has Rc distance from the rotation while the inner and outer edges have a distance to the rotation center as Ri and Ro respectively. We should have some criteria for the optimum sail width. The sail with should be optimum according to what? Since the center strip produces the maximum power and the inner and outer edges are the least efficient, we can define the TIP POWER RATIO as follows. 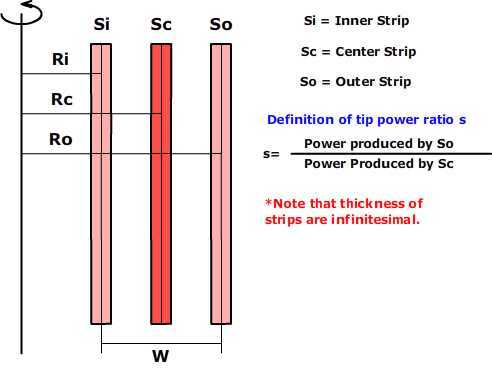 The ratio of the power produced by the tip strip to the power produced by the center strip is called TIP POWER RATIO and is represented by the letter or symbol ‘s’. Now we have our criteria in terms of TIP POWER RATIO or ‘s’. Lets assume that s = 0.75, what does this mean? It means that the tip strip will produce 75% (percent) of the power produced by the center strip. You make take s = 0.1, but does this make sense? Who would want to have a sail that only produces 10% (percent) of the power produced by the center strip? It will not generate much power at its tips. Not only that, but it will cost more and be prone to damage. So as a designer you should find an optimum ‘s’ value, meaning that it should be as large as possible to produce the most power. Notice that we said as large as possible, if we take s=1 which is the largest value, we have most efficient turbine whithout a sail, which does not make sense. Therefore s should be some large value but smaller than 1. To assist you, the designer, I found the relationships between, the sail width and the power produced by the turbine in terms of ‘s’. These findings are presented in the following figure. 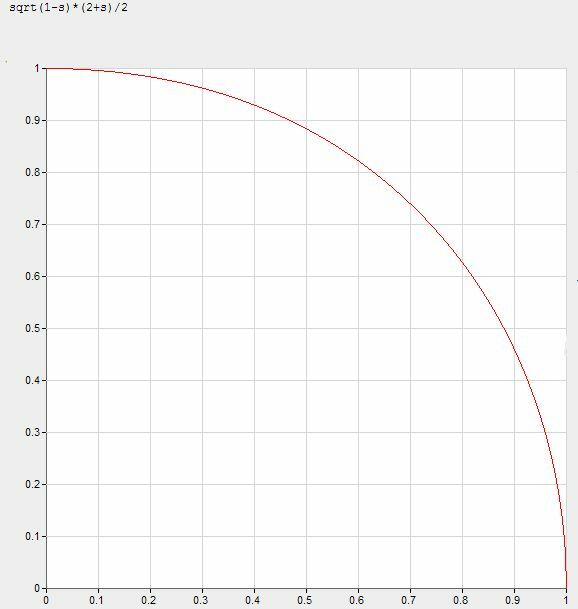 Plot 1 given below shows the ratio of the sail width to Rc (the distance from the rotation center to the sail center) as a function of ‘s’. Important observations are shown under the plot. When s = 1 the sail width is equal to zero. Most efficient case but no sail, no power. 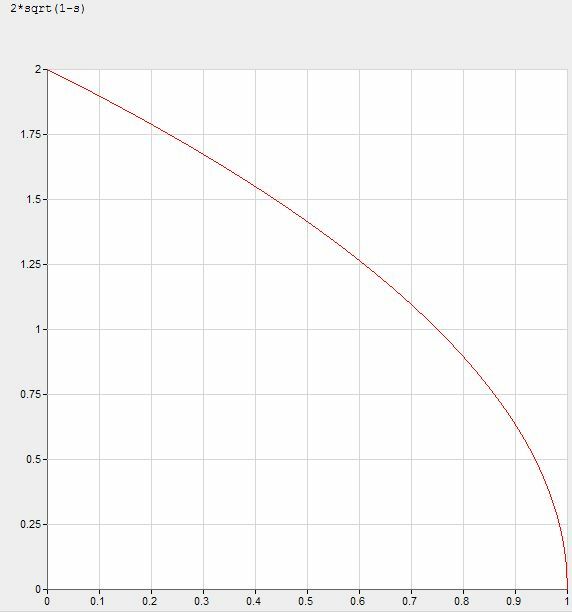 When s = 0 the sail width is equal to 2*Rc. This is widest sail possible. It is not practical to take s this low as it will be shown in the next two plots. When s = 0.75 the sail width is equal to Rc. When s = 0.6 the sail width is equal 1.26Rc. Plot 2, below, shows the ratio of power extracted by the turbine to the power available in the wind for the widest sail. This ratio is called the ABSOLUTE POWER RATIO. Note: for drag type turbines almost all the people use the power available in the wind of their calculation. 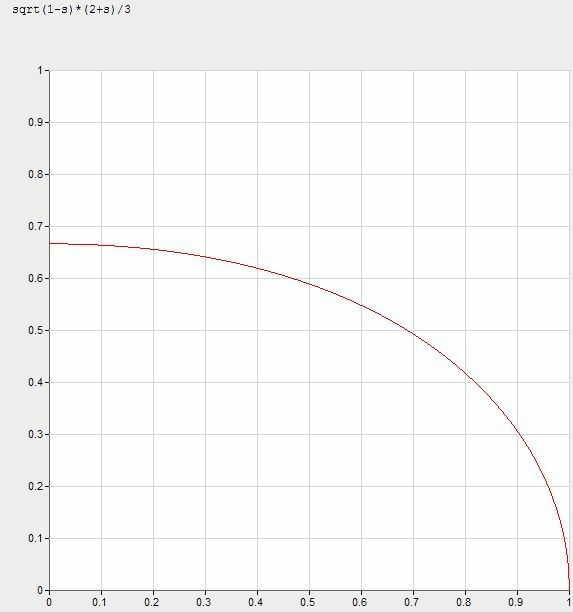 The plot above shows that this is not possible, the best case scenario is that you reach 2/3 of the power available. Plot 3, below, shows the ratio of the power extracted by the turbine to the max power extractable from the wind for a given sail width. This ratio is called the PELTON POWER RATION and is a good indicator of the percentage of power that can be extracted from wind. At s=0.6 %83 of extractable wind power can be axtracted. Further decreesing s will not increase power gain that much. In light of the equations given above with their corresponding plots one can find the desired flap type turbine design. To assist you, the designer, to do this calculation I prepared the following flash presentation. By changing the distance from the rotation center to the sail center Rc, the sail height h, the wind speed Vw and TIP POWER RATIO ‘s’ (in the green box) one can find the desired wind turbine for their specific needs. The power that can be extracted from the wind for a given design can be found in the red box on the top left corner. My conclusion is that s = 0.6 is the optimum choice. It produces 83% (percent) of available power in the wind and the sail width is 1.26*Rc. If we take Rc=100cm then Ri (the distance between the rotation center and inner rim of the sail) will be 37cm and Ro (the distance between the rotation center and the outer rim of the sail) will be 163cm. another good value for s is 0.5. It produces 68% (percent) of available power in the wind and the sail width is equal to Rc. If we take Rc=100cm then Ri (the distance between the rotation center and inner rim of the sail) will be 50cm and Ro (the distance between the rotation center and the outer rim of the sail) will be 150cm.